Well, this is the humble home of my first Zelda fan-fiction story, from the Battle For Power trilogy. Welcome, and I hope you enjoy reading. It 's finally finished (84 pages all together!!) 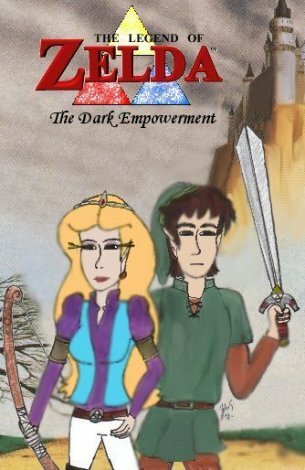 The characters and locations are those from Zelda I & II and the cartoon, who I feel are much more fun to write about, since Link & Zelda have more of a history together, and Hyrule is much vaster, so there's more places to go. It just seems that every story I've read is based on characters from Zelda III for some bizairre reason. Oh well... Yes, and I know Koholint Island was destroyed, but this is fanfic and anything can happen, right? I must add that my younger sister has helped on this so any gory fight scenes or bits with Kain by himself or with the King were written by her. Feel free to download all the parts or put them on your own page (yes please!). Simply click on the links below to read each chapter or download the zipped text documents. Things are going wrong in Hyrule. First of all, people called the Communion led a revolt against the Royal Family. In an effort to maintain the peace, the King stated that his daughter Zelda would marry the Communion Leader, Kain. The Princess was not happy with the idea. Zelda and Link wanted to get away for a while, so visited some friends at Valour Hold. While they were there, something strange happened to their magical powers. Ganon was not behind it. So who was? Impa suspects Kain. Zelda and Link suspect his Communion are out to destroy them both. Then Kain suddenly hands over the Triforce of Power to the King. How did he get it from Ganon? This is an UNOFFICIAL site and is in no way supported by Nintendo. The Legend of Zelda, Link, Princess Zelda, Ganon and other related characters belong to Nintendo. The images and information on these pages are purely for entertainment value only. All of the story texts belong to me, and may not be reproduced without my permission.